SUBHEAD: The Standing Rock Sioux protest is about competing ideas for the future of the planet. They have the high ground. 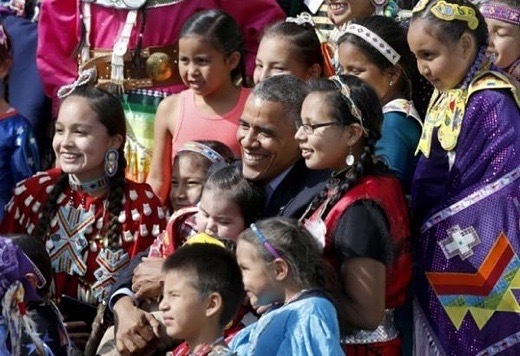 Image above: President Obama visits Standing Rock Sioux in 2014 and poses with a number of Native American youth. Would he betray their future? From (http://indiancountrytodaymedianetwork.com/2015/02/02/president-obama-wants-1-billion-indian-education-158971). America has more than 2.5 million miles of oil and gas pipelines crossing the country in every direction. So plans to construct the 1,172-mile Dakota Access pipeline from oil fields in North Dakota through South Dakota and Iowa to Patoka, Illinois, were supposed to be a nonevent. The regulatory process was largely through state commissions and the U.S. Army Corps of Engineers and far less stringent than the successfully opposed Keystone XL pipeline. On July 25, the Army Corps granted authorization for the pipeline to cross the Missouri River and Lake Oahe, and developers hoped to open the pipeline sometime later this year. It would transport some 470,000 barrels of crude oil per day—roughly half of the Bakken daily oil production—on treaty lands a half-mile from the Standing Rock Sioux reservation. The Standing Rock Sioux Tribe objected. The pipeline route threatens the tribe’s drinking water and would disturb sacred and cultural sites, and so the tribal government has opposed the project since 2014. A couple hundred tribal members went to the construction site on Aug. 12 with a vow to stop the pipeline. And to make that point clear, Standing Rock Chairman Dave Archambault chose to be arrested after crossing into the construction zone. Since that day, hundreds of Native Americans and allies from across the country have been camped near the Missouri River to join the protest. For now, construction has ceased while a court hears the tribe’s suit against the Army Corps for failing to comply with environmental and historic preservation laws. The tribe makes a strong case based on its treaty and U.S. policy. But no matter what happens in court, there are three reasons the tribe and its allies can stop this pipeline. First, people are more powerful than dollars. One Facebook post goes up and more people arrive. Everyone who shows up knows that they could be arrested and are willing to be. How many arrests, and how much will that cost the state and the developer? A local county sheriff has warned of violence. North Dakota Gov. Jack Dalrymple already issued an emergency declaration to give state agencies funding for “public safety,” which is estimated to cost as much as a million dollars. But the state is missing the point; this protest is about a competing idea for the future of the planet—and waves of people will show up to make that point. Second, the Sioux Tribe clearly has the moral high ground. An earlier proposal for the pipeline to cross the Missouri River north of Bismarck, North Dakota, was scrapped because it threatened the capital's water supply. So the very decision to move the route south was to sacrifice Native communities. A decade ago, even a couple of years ago, that might have worked. But not in the era of social media. People of goodwill easily recognize this injustice. Third is that this is The Moment. This is the most important reason the tribe and its allies can stop this pipeline. There has been for a long time a growing recognition that more oil, gas, and coal need to be left in the ground. Although Keystone was defeated by popular resistance, there were many opportunities in its regulatory path for that to happen. The Dakota Access pipeline is different because the government so easily flipped on the green light. Standing Rock represents the first opportunity people have to take a stand and disrupt business-as-usual. Once there was a case to be made for pipelines, but that moment was in our history and is now irrelevant. Many hoped there would be an easy transition away from fossil fuels to future sources. But easy transitions rarely happen in history. Instead, industry is hit by a disruptive force that changes everything, and today its name is the Standing Rock Sioux.